An estimated 320,000 Israeli protesters took the streets on Saturday night to protest the high cost of living and lack of affordable housing, more than double the number that had turned out the previous Saturday night. The demonstrators were specifically protesting the enactment of the National Housing Committee Law, which they do not see as a solution to the housing situation. In the largest show of force, 280,000 Israelis marched from Habimah Square to the government office complex in Tel Aviv’s Kaplan Street, while 30,000 demonstrated in Jerusalem, and there were smaller demonstrations in other cities across the country. Protesters chanted “The people demand social justice” as they marched through the streets of Tel Aviv. In the midst of tent protest leaders’ preparations for Saturday night’s massive march, voices are calling for a change in leadership. Dovzhinsky is not the only disgruntled demonstrator. Many agree with him, saying that the rising demands and dialogue are made by people with no burning need to end the situation. 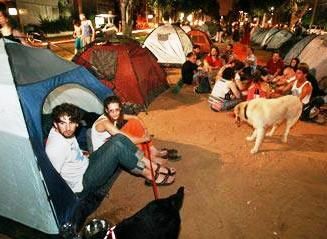 Tent protesters say that they would also like to see Shas supporters join them. “It isn’t clear to us why, until now, social movements like it have not joined us. The moment that happens, we’ll have huge power here that no on will be able to withstand,” said Dovzhinsky. Dovzhinsky adds that he has received no reply to his letter to the Prime Minister’s Bureau. Protest leaders met again today to formulate their demands from the government, after writing a preliminary list of demands yesterday. National Union of Israeli Students chairman Itzik Shmuli said that progress was being made, and that the protesters have no intention of giving up their struggle. The protesters also reacted angrily to the news that the Knesset had passed the National Housing Committee Law and blocked major junctions across the country. The protestors also plan a major march in Tel Aviv tomorrow night to protest the passing of the law. Specific demands reached by all the parties so far include cutting indirect taxes, especially VAT, investing surplus tax revenues in citizens through the state budget, increasing the Ministry of Housing and Construction’s budget for mortgage and rent assistance and easing eligibility criteria, and increasing government aid. The protesters have also agreed on extending free education from the age of three months; to add positions, hospital beds, equipment, and infrastructures to the healthcare system nationwide to OECD levels; and to halt the privatization of welfare and mental health agencies and an and to outsourcing civil service jobs. This is still only a first draft of demands, and more drafts will be written. The protest leaders said today that various demands published in the media and detailed in financial costs originated in a position paper for changing Israel’s social and economic policies written by Dror Israel several months ago. That position paper relies on data and studies by top Israeli and foreign economists. Responding to Ministry of Finance claims that the costs of the demands are inaccurate, the protest headquarters said that this was disinformation. “First, we consider the emerging public debate on how to increase the budget to be important and significant. The heart of the matter is an argument between world views. One view holds that the optimal state budget is one in which the government intervenes as little as possible in the market, privatizes as much as possible, and reduces its involvement. This is the policy that has existed for over 30 years in Israel, and it is precisely why people have hit the streets.